A fuel injection system cleaning is usually recommended in certain intervals, which can be found in your manufacturer’s owner's manual; however, if it is not in your owner's manual that does not mean your vehicle does not require to have its fuel injection system cleaned regularly. As always, at Midas we can look up your manufacturers’ recommend fuel injection cleaning intervals, even if they are not in your owner's manual. Regardless, the common consensus for a fuel injection service is about every 12,000 miles to 15,000 miles. Today’s new fuel injection systems provide balanced power, lower emissions and improved drivability. However, they are very susceptible to clogging and sometimes becoming completely plugged. Just as a garden hose nozzle can be set to spray a fine mist, your vehicle’s fuel injectors disperse gasoline in an even spray to all areas of the cylinders. Problems arise when contaminants in automotive fuels becomes deposited into the tip of the injectors, thus creating an altered spray pattern and reducing fuel flow. Restores the proper vacuum in the recirculation system by breaking down the build–up of resin left by stagnate, accumulated gases. Travels through the PVC system and combines with the crankcase gases to blast carbon build–up out of the combustion chamber. Poured directly into the fuel tank this product thoroughly cleans from the fuel intake to the injector tips. So stop throwing your money away. 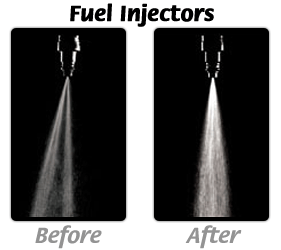 Have the experts at Midas clean your fuel injection system today! It’s the fastest way to a smoother running engine and better gas mileage. Using an effective and fast formula, a radiator treatment can remove rust, scale and mineral deposits from the cooling system, thus extending its life and improving its performance. The treatment also dissolves and disperses sludge, silica gel and oil residues. This is an effective treatment for all cars, trucks and SUVs. We recommend having this service performed every 24,000 to 36,000 miles or ever two years.